The players involved in the exploitation of wildlife for profit and wildlife trafficking are organized and frequently utilize sophisticated methods to conduct their activities. To effectively address the level of sophistication and organization currently seen in wildlife trafficking international law enforcement must make use of modern investigative methods commonly known as specialized investigative techniques. In the United States specialized investigative techniques, including undercover businesses, have long been considered essential to the detection, prevention, and prosecution of priority areas of investigation including wildlife crimes. With very few exceptions this is not the case in much of the European Union, Africa and Asia. Undercover operations allow law enforcement to get inside criminal entities, to find out how they work, and to identify who the players are. Undercover work can be a very effective method of addressing criminal activity that simply cannot be addressed by any other method. Undercover operations allow law enforcement to infiltrate criminal enterprises, document violations from the inside, and identify ringleaders, masterminds and kingpins. They also enable collection of evidence, including the level of knowledge by those responsible as well as their intent. Consequently, prosecutions of undercover investigations have a very high rate of conviction and significantly larger penalties as compared to other types of investigative work. Specialized investigative techniques are not new and in fact, in countries where they are applied, they have shown to not only uncover illegal activity, that would not be able to be addressed by normal reactive law enforcement techniques, but they also provide an on-going deterrent to criminals who have to second guess whether the dealer or supplier of their illegal goods is a law enforcement officer or not. Many countries are effectively using these techniques today, but many parts of the world, including much of the EU, Africa and Asia, reserve these types of advanced techniques exclusively for serious high priority crimes including violent crimes, narcotics and terrorism. In May 2013 the international community took steps towards removing this impediment. 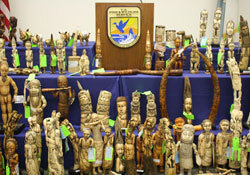 On May 1, 2013, the United Nations Commission on Crime Prevention and Criminal Justice almost unanimously agreed to a resolution calling on the nations of the world to recognize wildlife and forest crimes as a serious form of organized crime and strengthen penalties against criminal syndicates and networks profiting from such illegal trade. This was a breakthrough resolution in terms of recognizing the serious nature of wildlife crime and largely viewed by advocates as a method for encouraging governments to increase the penalties associated with these types of crimes. This resolution should also be seen as an encouragement for governments to utilize enforcement techniques which had heretofore been reserved for violent crimes, trafficking in narcotics and terrorism. It’s hard to argue against the effectiveness of specialized investigative techniques. In places like the United States and the United Kingdom where they have been applied they have shown to be a very effective tool in dismantling some of the most sophisticated and entrenched criminal enterprises. That is not to say that the use of specialized techniques does not present significant challenges for agencies looking to make use of them. Use of specialized investigative techniques involve a considerable commitment of an agencies time, manpower and funding. Consequently, use of these techniques should be seen as a significant demonstration of a countries level of commitment in regards to combating wildlife trafficking. In addition to the commitment of resources, use of specialized investigative techniques also demonstrate a countries commitment to dismantling criminal enterprises involved in wildlife trafficking. By their very design specialized techniques, including undercover operations and businesses, seek to infiltrate criminal networks and build a case against high level participants, including organizers and facilitators. Specifically, these operations look to target those who profit most from the illegal activity. Too often, what appears like good law enforcement on the surface, i.e. a large cache of elephant ivory seized at a port of entry, results in little to no follow-up or arrests of those ultimately responsible for the contraband shipment. A well designed, well executed undercover operation can “uncover” and ultimately bring to justice all the players involved, from corrupt officials who looked the other way or rubber stamped the shipment, to the person or entity that placed the order in the first place. Clandestine analysis of computer hard drives, web sites etc. Since regulations for the use of specialized investigative techniques vary widely from country to country, evidence collected in one country may be of limited or no use to other countries involved. This can be overcome with effective communication and coordination by all countries involved in the investigation. Through the use of formalized Joint Forces Agreements (JFAs) and Memorandum of Understanding (MOUs) law enforcement agencies can ensure evidence collected can be utilized effectively and those involved prosecuted to the greatest extent possible. Not to be overlooked in the planning process of joint investigations is involvement and concurrence by prosecutors. In the United States the Department of Justice is involved from the earliest planning and development stages of an operation. Operational Plan – detailing the purpose of the investigation, methods and techniques to be utilized, as well as an explanation of why the proposed operation is the most effective and efficient means of accomplishing the enforcement objective. Intelligence – providing up to date intelligence on any known targets, smuggling routes, methods of concealment, etc. Approvals – at the appropriate level in the organization for all law enforcement agencies involved. Prosecutor approval, or at the very least concurrence, with the proposed operation, including legality of the techniques to be utilized, should also be sought. Authority – lawful authority to conduct for all jurisdictions anticipated to be involved, as well as any limitations, should be outlined. Duration – the estimated period of time for completing the operation, and monitoring mechanisms in place to ensure the operation does not continue any longer than is necessary to achieve its objectives. Finances – details as to which agency is providing funding in support of the operation. Final disposition of any leftover monies, as well as how any fines and monetary sanctions will be distributed should also be covered. Media – an understanding of when and who will disseminate information to the public regarding outcomes of the investigation should also be formally memorialized within the agreement. Another challenge faced by law enforcement agencies contemplating use of specialized techniques is the defense of entrapment. Entrapment is inducing or encouraging an individual to engage in criminal activity that he/she would otherwise not be predisposed to engage in. Said another way, entrapment occurs when law enforcement originates the idea of a crime and then induces another person to engage in conduct constituting such a crime when there is no indication the other person is not predisposed to do so. The key, therefore, to overcoming entrapment as a defense is establishing predisposition. This can be done by showing a person’s involvement in criminal activity prior to any involvement by law enforcement. It can also be overcome by showing the person’s level of knowledge of the crimes for which he/she is being investigated. Lastly, for wildlife investigations, and in particular investigations involving threatened or endangered species, law enforcement agencies must also ensure that they are not creating or inflating the demand for these items. The goal for law enforcement agencies should be to infiltrate already established criminal enterprises, not encourage the development of enterprises not already in place. Consequently, law enforcement agencies need to ensure they are not offering to sell or purchase wildlife items far in excess of the current black market value. Similarly, they should not look to trade in wildlife items in quantities that far exceed what is commonly seen and interdicted by law enforcement.